Instant Pot Pineapple Chicken is going to be one of the easiest chicken recipes to make in your magic making electric pressure cooker. This is one of those constant recipes that I have been making for over year, and I finally decided to put it up on my blog. I know…a little delayed bird action, but I finally decided to take photos and share super easy recipe with you all. Click Here to Join My Instant Pot Weight Watchers Recipe Facebook Group! I was in the beginning stages of my Instant Pot days, and I was still trying to figure everything out with it. Stephen came home with a bottle of Trader Joe’s Pineapple salsa, and I fell in love with it. The next day, I made bring home another jar because I knew that I totally wanted to use it to make Instant Pot Pineapple Chicken. The Pineapple salsa had all of the makings of a fabulous base for the sauce for it! I am so spoiled that he works at Trader Joe’s. I get to try so many different new products out, and sometimes before anyone else! I love it. We made some jasmine rice with it (from Trader Joe’s, too) and called it a delicious and easy dinner! However, now that I’m a on Weight Watcher’s diet plan, I don’t eat rice with it…I don’t eat rice at all. I know that I can eat a little bit, but I love that I can eat this for ZERO POINTS. Yes…you read that right…zero points! My Instant Pot Pineapple Chicken has ZERO FreeStyle Points! This is what is making me love the Instant Pot pineapple chicken recipe even more: It has zero FreeStyle points! It makes ordinary instant pot chicken recipes much more fun, vibrant, and less boring. Admit it, we can seriously only eat but so much of one type of chicken before it becomes boring. Once food becomes boring, then we start losing our motivation. Our palates are excited at first, but then it starts becoming…meh. I want those carbs! Believe it or not, I DID find a way to beat my snack chip carb cravings! You know because…I miss that crunch of chips and crackers! Well, I made these amazing “everything” seasoned tofu chips/crackers and they were pretty damn good! Actually, so much better than what I thought they were going to be. In my Instant Pot pineapple chicken recipe, I use a little bit of a cajun seasoning called “Slap Ya’ Mama!” To me, it’s by far one of the most amazing cajun seasonings around! I actually had one of my most amazing BIFF send me a bottle because she told me about it. I laughed at the name, but man that’s some good stuff! Enjoy my Instant Pot Pineapple Chicken Recipe! I already know that you’re going to enjoy it because it’s so simple to make, and it’s super yummy! Most people might call it Hawaiian Chicken, but it’s missing a few ingredients to really make it that way. Enjoy! My Instant Pot Pineapple Chicken is the best way to enjoy chicen and pineapple together that everyone will adore. MAKE SURE YOUR POT LINER IS IN YOUR INSTANT POT! Place all ingredients into the pot liner of your Instant Pot. Close and lock the lid, and turn the vent to closed position. Place on High Manual Pressure for 12 minutes, and allow to NPR. Once depressurized, open the vent to ensure that all pressure has been released. Pull out the chicken breasts onto a plate or cutting board, and shred with forks. Once the chicken is shredded, add it back into your IP. Let it set for a couple of minutes to marinate in that pineapple yumminess! 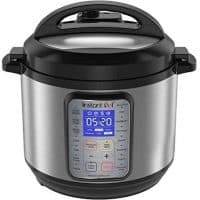 Please note that some models of the Instant Pot does NOT give you control over High or low pressure settings. Some are automatically set to high. If you are using frozen chicken, it will take longer to come to pressure. Also, add an additional 5 minutes of cooking time on to it. You can cook your rice in the pineapple chicken broth that's in your IP! It will make it so flavorful. I used a 6qt Instant Pot, and it took about 9-10 minutes to come to pressure. Instant Pot Weight Watchers Recipes (How I got started!) *This has a printable meal planner! You can “Pin” this image of the Instant Pot Pineapple Chicken recipe on Pinterest, too! Your recipe for Pineapple Chicken sounds delicious but I think you’re forgetting to count the pineapple salsa in the Weight Watchers points? Thanks for sharing…I’ll definitely be giving the recipe a try! With the new FreeStyle Program, there’s tons of Zero point foods! YAY for us! Trader Joe’s pineapple salsa comes up as zero points on WW! I love it! Do you include the pineapple juice? Yes! 😀 I updated the recipe to be just a bit more clear that you use the juice of the pineapple chunks as well. When I scan the pineapple can it says it 4 points. If it was drained it would be zero points. How is this soup zero points? I just made it and it is delicious! Hi Anita! THat’s so weird, because mine scanned for zero points. Hmmm. It can be a little confusing. However, I’m so glad that you enjoyed it! David, do I cook for the same amount of time if I make 1/2 recipe? Just 1/2 of all the ingredients? Yes. I would totally still do the same amount of time. How much rice did you use in the pineapple chicken broth? When you say pot liner, do you just mean the metal inside bowl? Or is there some sort of other liner I should be using? Your main cooking pot! So many people forget to ensure that their IP liner isn’t in the IP itself. I would cry if that happened to me. How would you cook the jasmine rice in the broth as described above? Hi Jen! If anything, you can add a cup of jasmine rice on top of all of your ingredients before closing the lid and cooking! Instead of cutting the recipe in half can I freeze half for another dinner? If you don’t have that type of pineapple salsa, you can always make your own, or use the WW app to check the points of other ones available. Hope this helps! Walmart has a pineapple/peach salsa that I’m going to try. ANother Pineapple Salsa will do! Just double check the label for added sugar and add into the calculator! A few do have points. Idon’t like Cajun or spicy. Can I substitute some other seasoning?